Are you not new to this business, and during your time in it have you become well aware of the market and gained valuable contacts? And have you sometimes considered that details on your contact list can be turned into money? You can become the partner of «Inmarine» and receive income from our projects. 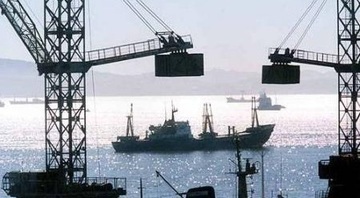 Deals for sale and purchase of vessels are performed. New vessels are built and old vessels are repaired. New agent companies, shipowner companies and shipping line companies are created. Debtors refuse to pay their bills. Terms of loading and carriage of cargo are breached. Collisions, accidents, salvage operations and many more take place. These situations are part of everyday, regular life for all maritime business participants. And practically all of them require legal support from maritime attorney or shipbroker. Is it possible that you are aware of companies, which presently are in need of qualified legal assistance or maritime brokerage? Recommend us as an executor in a maritime project to your known contacts, colleagues or partners and receive 10% of amount of payments received by us. Beyond that, we also provide to the client, which have addressed us based on your recommendation a discount of 10% from the budget of his project with us. “Inmarine” partnership program is beneficial to clients, which you have recommended! Carriage facilitators (maritime agents, freight forwarders, shipping lines). Insurance companies, which provide marine insurance as their service. Financial entities, which allow maritime credit operations and leasing of vessels. Also cargo owners, supply companies and other players in maritime business. In order to become our partner and to recommend our services, you should fill in a form below. We shall contact you in the near future and shall provide you with a certificate with unique partnership number. You can send this certificate by email, or you can print it out and hand it over to any person who is interested in our services. This certificate number is unique and is to be your partnership ID. 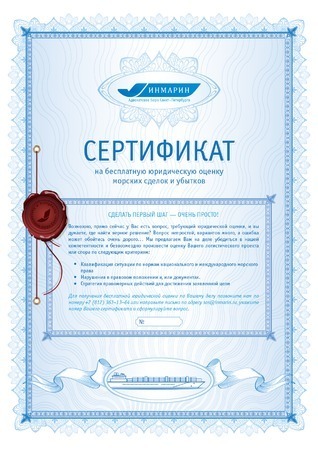 The client, which has shown to us this certificate with your ID number, shall receive a 10% discount from the budget of his project on the day of conclusion of agreement for provision of legal assistance, and you shall receive your 10% agency reward guaranteed, by any means of payment acceptable to you! To receive the certificate and the unique partnership number please fill in the contact form below. State your name, surname, contact phone number and email for us to contact you. If you are a representative of a company, please state the name of this company. After you have filled in the form, please press “Become a partner” button, and our manager shall contact you in the period of one business day from the moment we receive your application.